Like the cabbage, the cauliflower is a rustic, peasant vegetable, with none of the romance of smooth, gemlike cherries, the dark exoticism of aubergines or even the subtle Impressionist bronze of onions. There has been an occasional great cauliflower painting (George Lambert’s wonderfully illuminated cumulus of 1926, and, slightly earlier, Alfred Hirv’s snowy composition with cucumbers and onions). These are just very good paintings of still-life arrangements, however; they lack Stephen Rose’s ability to imbue the most unpromising and humble organism with a profound inner life. 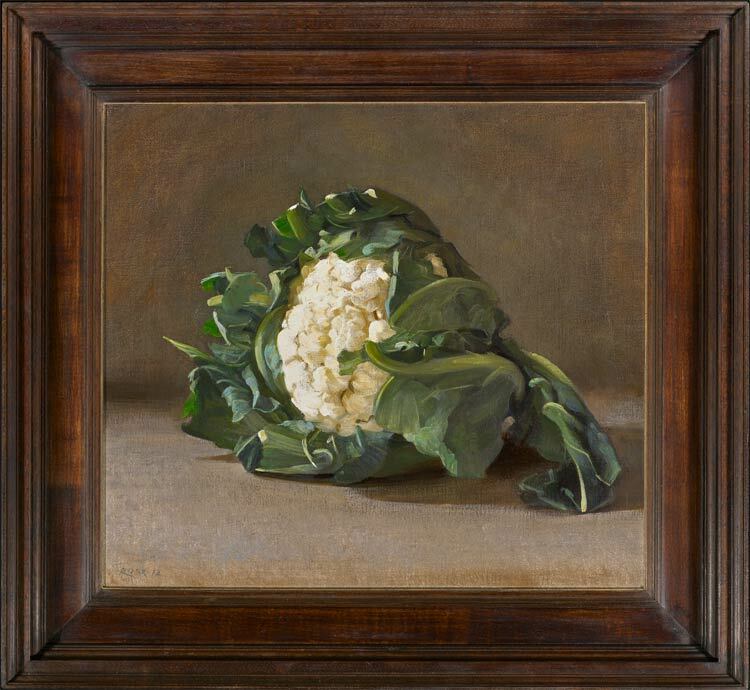 His cauliflower is unadorned and almost untrimmed; it lies in its Baroque swathe of blue-green leaves, meditating on its own transience, one leaf trailing like a broken wing, beginning to darken and wilt; a pure, creamy memento mori, like an ivory skull, set in an abandoned and undefined space which prickles with apocalyptic imminence.